After a successful debut in 2018, the Super Series is back for 2019. The Super Series is a number of friendly interclub events designed to encourage participation for the members and comprises different events throughout the year. The Series is a club competition with the winning club scoring the most points over the 5 events with individual awards for the top 5 male and female competitors. Organisers are encouraged to adopt a scoring system that promotes participation whether competitively or for fun and across the age groups. This year, we will permit participants from the age of 15, subject to safeguarding provisions of the club (and or parent) of the individual. This is a fantastic introduction to multi-sport events for novices and great training competition for the more experienced. Participants must be a member of a club within the Super Series. 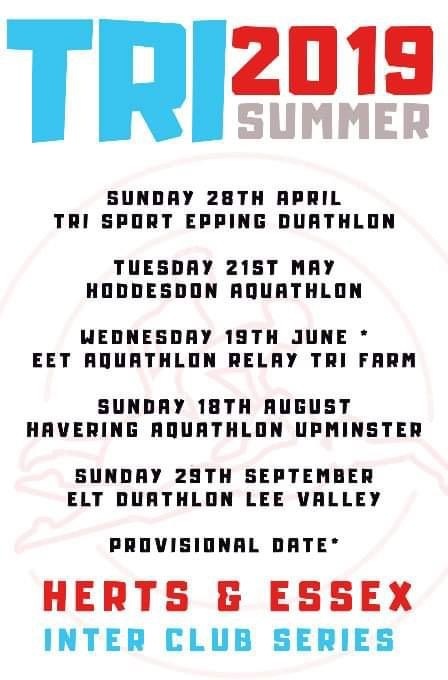 The clubs competing in 2019 are: Tri Sport Epping; East London Tri; East Essex Tri; Hoddesdon Tri; Harlow Tri; Bishops Stortford Tri; Havering Tri; and Walden Tri. New clubs wanting to compete please contact Tri Sport Epping.